As Spring is finally starting to show itself here in Melbourne – yay! – we’re also starting to get those typical Spring cleaning feelings where we want to de-clutter our houses, dust every nook and cranny, re-arrange the furniture and of course detox our bodies ready to start FRESH! We’ve put together our top tips & favourite ways to detox so you’re feeling light & bright in body, mind & home & ready to enjoy all of the beauty that spring has to offer. This is probably one of the most important ones for us. If you want to be feeling your best going into Spring, a detox of some sort is usually the best starting point. Over winter we can accumulate a lot of toxins within the body; we’re indoors more, we are less active & our diets are generally heavier than the warmer months. By simply giving your body a few days to rid itself of these toxins you’ll be welcoming the new season with a healthy body & mind! If you haven’t heard of this amazing healing system then do yourself a favour and start researching! Ayurveda is one of the oldest holistic healing systems stemming from India & is based on the belief that wellness comes from a balance between a healthy mind, body & spirit. We have been following Ayurveda for quite a while now & it is the perfect health modality to help kick start your Spring detox. By incorporating a clean, whole foods diet along with morning tongue scraping, self massages using oils & daily yoga & meditation, an Ayurvedic detox will help rid your body of all the excess toxins that have accumulated over Winter as well as clear & revitalise your mind. Detoxes aren’t always appealing but trust us, an Ayurvedic one is pretty amazing. Everyone deserves a little self love don’t they? We’ve found a great one over at Banyan Botanicals They even offer herbs to assist you along your detox journey. Okay so, before we go and suggest you do a juice cleanse, here is a word of advice for our Victorian friends – or any friends in a cooler climate area – avoid in cold weather!! We may have been a little too eager to trial different detoxes here at Collective Sol & we did our juice cleanse in the middle of the Melbourne Winter…suffice to say it wasn’t our favourite. It was only 3 days but it was the hardest 3 days ever! We’re not against juice cleanses, we actually do enjoy them, the benefits are incredible, but we do recommend finding the right time of year for you, such as Spring! For us sun seekers, we’ve learned to stick with soups and curries in Winter and keep the juice cleanses for Spring & Summer! Juice cleanses can be a great way to give your digestive system a rest & clear out the toxins we keep talking about! We’ve found a company that looks like they do an awesome juice cleanse called Sol Cleanse and the thing we love about them is that they include warming elements so you incorporate a bit of balance throughout your day. If you are interested in a juice cleanse, check them out. Simple Tips you can start today! 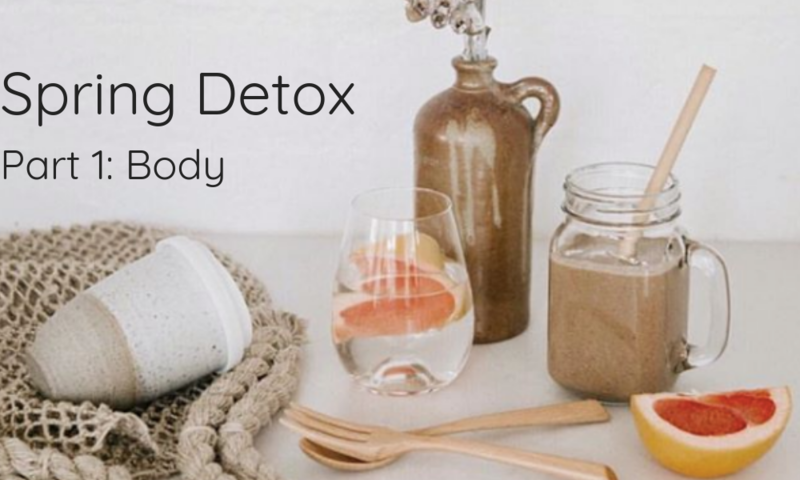 If you don’t want to go all out with a full on detox, we’ve listed some simple suggestions below to incorporate into your daily routine to get you on the right path for Spring. Incorporate more whole foods into your diet – reach for a piece of fruit over reaching for the biscuits. Drink herbal teas instead of stimulants such as caffeine and sip on lots of warm water throughout those cooler days. So there you have it, part 1 of our Spring detox series. Next week we’ll be diving into movement and our favourite types of detoxifying exercise.